Prevue Medical offers educational models to show details that are nearly impossible to grasp on a computer screen. They work with medical professionals to gather patients MRI scans and convert them into a working CAD model to be 3D printed. Some of the specimens that are produced include: portions of a spine, skulls (post trauma), wiring of the human brain, and color-coded brain models to illustrate patterns. This allows doctors to have full-scale replica specimens in their hands, for diagnosis and treatment. Prevue Medical recently collaborated with Dr. Steven Laureys, MD, director of the coma Science Group in Belgium. Dr. Laureys and his team assess the recovery of neurological disability in severely brain damaged patients with neuroimaging, or MRI’s. 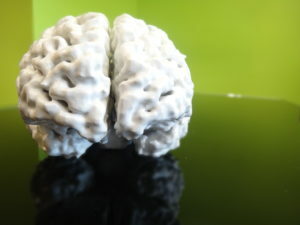 Dr. Laureys provided Prevue Medical with a human brain MRI to convert into a working CAD model and then asked us to then produce it as a RapidNylon™ specimen. We produced the brain in two pieces, representing the two hemispheres without compromising the high level of detail, both inside and out. We then finished it with a bright white paint and clear coating so that Dr. Laureys could use a dry erase marker on different sections to better demonstrate specific details. Dr. Steven Laureys was recently highlighted at a TEDx event in Paris, France where he used the RapidNylon™ brain specimen to demonstrate his research. Dr. Steven Laureys speaking at TEDxParis with a RapidNylon” brain model.